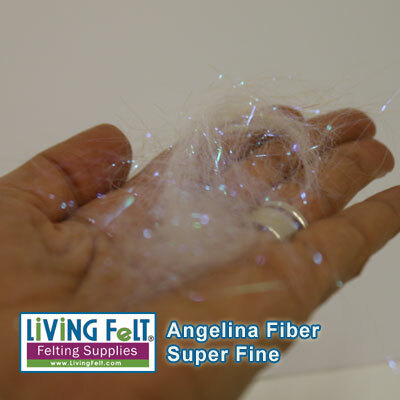 As this fiber glimmers, you will see a blue-ish glimmer, but the fiber is white. Perfect for wintery projects! 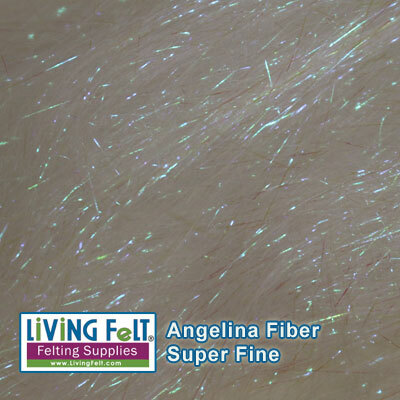 Add shimmer and glimmer to your wet felting, needle felting or nuno felting projects... a little Angelina goes a long way! Working with Angelina is very similar to working with wool - you can hand blend colors, you can layer it and it bonds to itself (with heat and pressure). Of course Angelina does not "felt", but you can anchor it down with wool. You can make a thin fabric of Angelina and then wet felt that into a larger project.